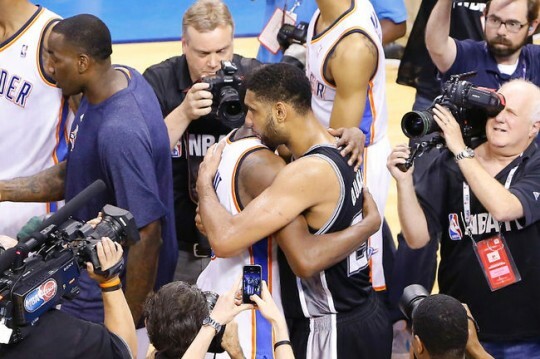 With their loss to the San Antonio Spurs in Game 6 of the Western Conference Finals, the Thunder’s season was brought to an end. A little disappointing, but with everything the team faced this season, it could be viewed as a positive step moving forward. Before we head into the off-season, here are 5 thoughts about the series that was. The first two games of the series tell the importance of Serge Ibaka. The Spurs dominated inside (averaged 60 points in the paint per game in those first two games) and punished the Thunder from outside when they collapsed (9 threes in both games). Granted, the Thunder’s perimeter defense was so bad, even a healthy Ibaka wouldn’t have helped in those two games. The Thunder were constantly switching on pick and rolls and were exploited when the switch presented a bad match-up. Add to that the fact that Nick Collison and Kendrick Perkins don’t have the lateral quickness to keep up with PnR switches on quick guards, and you have a recipe for disaster. Even when the Thunder guards went under the screen, the defense, wary of its lack of a shot blocker, collapsed into the paint and left the Spurs’ shooters open from the outside. But surprisingly, the offense suffered even more from Ibaka’s absence. Without the release valve that is Ibaka, the Thunder play-makers (Kevin Durant, Russell Westbrook, and Reggie Jackson) were forced into either pick and rolling with Perkins, Collison, or the inexperienced Steven Adams, or playing isolation ball. Both of these options played into the Spurs’ strength as an experienced, coordinated defensive unit. The Spurs love to take away your first option and make your 2nd and 3rd options beat you. That’s why Ibaka is so important to the Thunder’s attack. A wing/big PnR involving Ibaka usually succeeds because the big defender will usually hedge towards the perimeter player. When that happens, Ibaka usually pops opens up for his deadly mid-range jumper. With Ibaka out of the picture, the Spurs big was able to hedge over onto the wing player as the big presented no threat of either rolling or popping out for a jumper. The Thunder trio shot only 43% (42-98) from the field in those first two games. The Thunder’s success with Ibaka also lends credence to the decision to keep Ibaka and trade Harden. Now, the decision was a lot more complex than just Ibaka vs. Harden. The team tried to keep both. But with two max players already on the roster, the team couldn’t afford to pay a third max contract, Ibaka’s near max contract, and Perkins’ bloated contract. It would have been cap suicide and, eventually, one (or two) of those 5, would have been forced to leave via trade. Also, the team couldn’t afford to pay that much money for someone who only plays one side of the floor. So the decision, while difficult, seems to have been the correct one. Ibaka’s value to this team as a two way player would have probably outweighed Harden’s value as a secondary/tertiary scorer. 2. Experienced team ball trumps isolation ball most of the time. It worked one time, in 2012. But for the most part, an experienced group that runs an offensive system usually beats the team whose offensive system depends on the greatness of a small amount of its parts. I’ve gone over it, ad nauseam, about how the lack of an offensive system dooms the Thunder when A) the defense is good enough to key in on the main components of the Thunder’s offense and B) when the Thunder’s supporting cast doesn’t provide enough. Royce Young, of ESPN and DailyThunder.com, discussed how, in the 6-game series, the Spurs averaged 334.8 passes per game, while the Thunder only averaged 252.3. Does this tell the whole story? Of course not. But the more passes you throw, the more the defense moves around. That is the staple of the Spurs offense. It’s designed to have the defenders follow the ball, until someone without the ball gets open or until the defense is spaced out enough to allow penetration. The Thunder, on the other hand, relied on the ability of Durant, Westbrook, and Jackson to create things in isolation situations. When they received little to no help from the supporting cast, which happened a lot in this series, those three players were left to work things out on their own. 3. Russell Westbrook is not scared of the moment. Not only in this series, but throughout the playoffs, Westbrook proved that he was not scared of the moment. He showed up, time and time again, for the Thunder when they needed him the most. Be it a late game steal or some “ice-water in the veins” free throws, Westbrook showed that the closing act for the Thunder was not just a one man show. I always worried about Westbrook’s clutchness prior to this season. Be it the lack of opportunities or just the wild, unpredictable nature of his play, I never thought that Westbrook had the discipline to be clutch. And while a lot of his clutchness was within the realm of chaos, when Westbrook did it, there was a sense of calmness about it. 4. Tim Duncan and Manu Ginobili are still pretty damn good. I don’t know what wizard or voodoo witch doctor these two have visited throughout the years, but their play is still as good now as it was 10 years ago. They may not be able to sustain their style of play in the world of “4 games in 5 nights,” but if they are given days of rest, they can perform like it is 2004. Some of the credit definitely goes to the players and their disciplined off-season training regiments. Duncan has picked up boxing in the off-season and has slimmed down as he has aged to take the wear off his knees and ankles. And Manu, I have no idea what Manu does, but the weight he continues to lose on his head, apparently has a positive effect on his play. A lot of the credit, though, goes to their coach, Gregg Popovich, and how he manages their minutes. Pop does a great job of resting his players (young and old, mind you) throughout the season. He could care less about how the NBA views his player rest habits and more about the bottom line, which is to be rested when it comes time for the postseason. Also, Popovich is not into miraculous comebacks. If his team is losing by a sizeable amount, Popovich will not hesitate to pull his starters for an entire quarter to rest them for the next game. All of these factors made it appear like Duncan and Ginobili were a lot more rested throughout the course of the game than the young Thunder. It was no more apparent than in Game 6, when Duncan and Ginobili carried the Spurs throughout the 2nd half and into overtime, while Tony Parker was held out with a bum ankle. 5. Its hard getting back to the promised land. It almost feels like the Thunder are the Israelites wondering around in the wilderness for 40 years in the book of Numbers. We’ve reached the promised land before, but didn’t do what we needed to do to stay there. Instead, we’ve spent that last 2 seasons trying our hardest to get back. Obstacles have gotten in our way, namely injuries and lack of depth/experience. I have no doubt that we will one day get back to the promised land, but the journey, can feel extremely long and tortuous. In the end, hopefully, it’ll all be worth it. One of my favorite Jay-Z songs from early in his career was “A Week Ago”. The basic premise of the song deals with the chronology of living a drug dealer’s life and how things can change in the span of a week. One minutes things are going good; the next, you’re left wondering how things could have gotten so screwed up when it was all good just a week ago. Rewind back to May 22nd. The San Antonio Spurs were coming off another blowout victory over the Oklahoma City Thunder, held a 2-0 lead in the series, and were looking completely unstoppable. 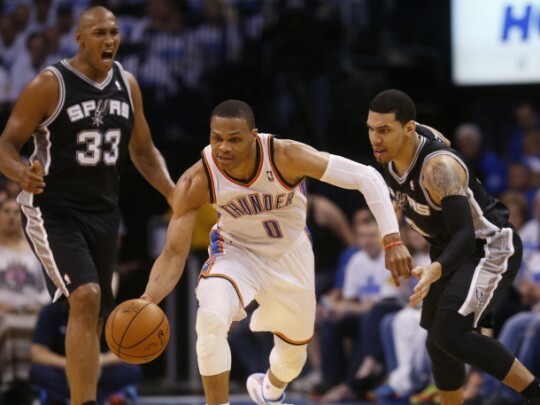 The Thunder were thought to be the worst match-up possible for the Spurs. A team that had beaten the Spurs 10 out of the last 12 times they had played, to include the 2012 Western Conference Finals. But the Thunder were without their best defensive player and without one of the main components of their offense in Serge Ibaka. A lot like the Russell Westbrook injury from last season, the Thunder were not very familiar with life without their athletic power forward. In the past 4 seasons, Ibaka has only missed 3 games total, none in the playoffs. As is the case with most other changes, there was an adjustment period to get used to. And it showed in the first two games of the series. The Thunder were unathletic and slow. They couldn’t defend the paint, and when they overcompensated, they were punished from the 3-point line. The Spurs averaged a blistering 60 points in the paint in those first 2 games and made 9 threes in each of those games. The Thunder offense was unimaginative and stagnant. Without the release valve that is Ibaka, the offense was left in the hands of Kevin Durant and Westbrook (and Reggie Jackson, but his production can be inconsistent at times). While great, those 3 players aren’t enough, especially for a great defensive unit that is keying in on them. And so, the media was already writing out the Thunder’s obituary on the 2013-14 NBA season: A great season that was marred by injuries at the wrong times. But then came word that Ibaka’s calf was responding to treatment a lot better than expected. The swelling had subsided to the point where the team changed his status from OUT to DTD (day to day). His only obstacle would be his ability to play through the pain. If you know Ibaka’s story, you know that physical pain is the least of his worries. The question was never whether Ibaka would play. With little to no risk of compounding the injury, the only worry was in reinjury. And with an entire offseason ahead, Ibaka could easily rehab a strained calf muscle during the summer. The question was how effective would he be. Would he be the dominant defensive player that we’ve all come to know in the past 4 seasons or would he be a shell of himself? That question was answered emphatically in the first three minutes of Game 3, in which Ibaka had 6 points on 3-3 shooting, 1 rebound, and 1 block. 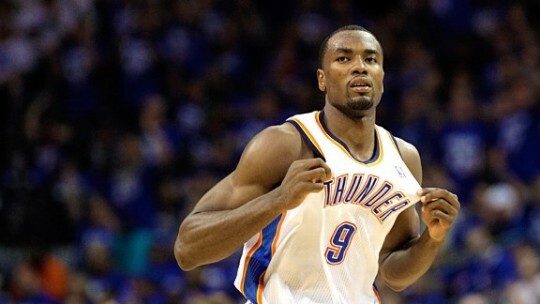 Even though he limped noticeably at times during the game, an Ibaka at 80% is a whole lot better than no Ibaka at all. 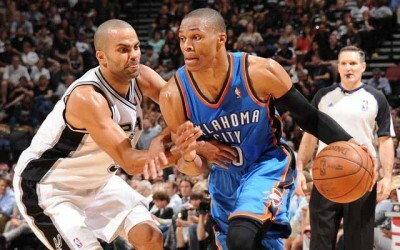 The Thunder took control of the game in the 2nd quarter and kept the Spurs at bay the rest of the game. The end result was a 106-97 victory for the Thunder and a proverbial pendulum that had possibly reached it’s maximum height. After that Game 3 victory, the same media members who were writing the Thunder off just days before, started to feign the other way. 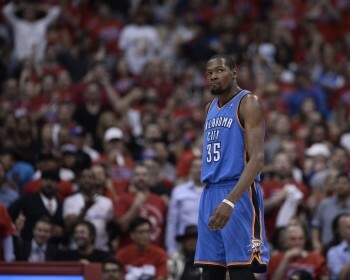 Could the Thunder repeat what they had accomplished in the 2012 Western Conference Finals? If you remember, the Spurs also held the home court advantage in that series and went up 2-0. Of course, those first two game were a lot more competitive than the first two games this year. But the results were still the same: San Antonio leads 2-0. The series switched over to OKC and the Thunder won their two at home. Tie series. 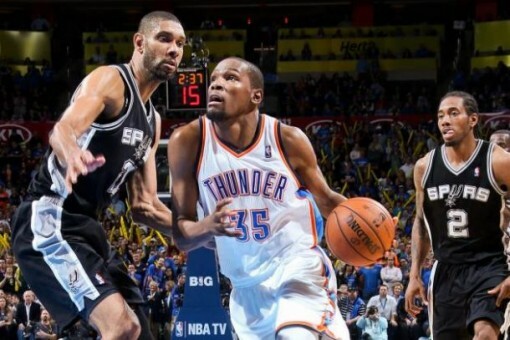 The Thunder then won a close one in Game 5 in San Antonio and closed the series out in 6. Gentleman’s sweep. Could it happen again? If anything, Game 4 was the biggest game of the series for the Spurs. Win that one and you not only kill any of the momentum built by the Thunder from Game 3, but you also kill any of the ghosts from the 2012 series. Lose Game 4, and the Spurs all the sudden turn into the speeding driver looking in his rear view mirror after he passes a police officer. The Spurs looked like they were all business, opening up Game 4 on an 8-0 run. From there, the Thunder went on to outscore the Spurs 58-35 in the first two quarters and the rest of the game was but a mere formality. Pendulum completely in full swing the opposite direction and the Spurs nervously looking in the rear view mirror. It was all just a week ago. But that has been the theme these entire playoffs. Every game has been a narrative in and of itself. And Game 5 will be no different. 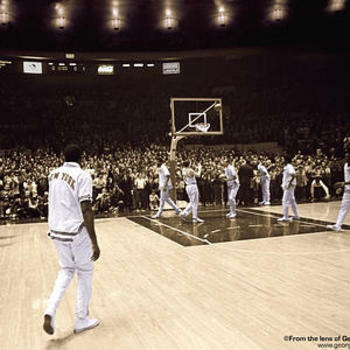 Can the Spurs recover mentally from the PTSD-like nightmare that may be haunting them? 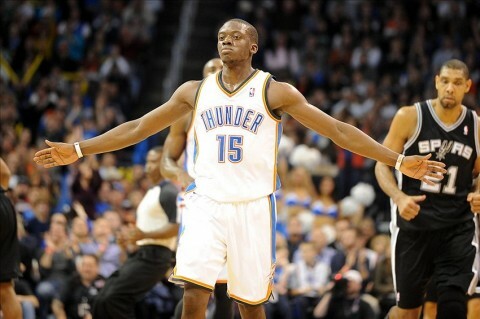 What is Reggie Jackson’s condition and will he be effective? So many questions that will be answered on Thursday. Pendulums could swing again and rear view mirrors may become obsolete after tonight. A running theme for me these playoffs has been fate. It was fate for us to face the Grizzlies in the first round to exorcise the demons from last season. It was fate for us to face the Clippers in the second round, as they have players that are interwoven into Oklahoma’s history. 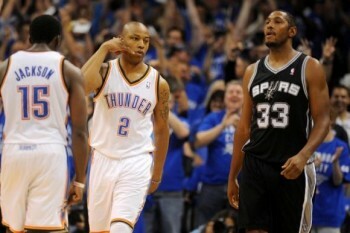 And again, I believe it is fate for the Thunder to meet the Spurs in the Western Conference Finals. The Spurs are the model by which the Thunder are built. A sort of big brother, if you will. Many of the main components on the Thunder come from the Spurs organization, from the owner to the GM. Over the past three seasons, the Thunder and Spurs have been the best two teams in the conference and this is something of a rubber match. Unfortunately, Serge Ibaka won’t be participating in this series. A Grade 2 calf strain will cause the power forward to miss the rest of this postseason. While both teams won’t be at full strength, this has never stopped this series from being competitive and fun. 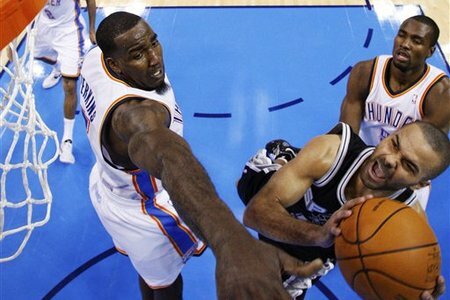 Even since the Thunder did a gentlemen’s sweep of the Spurs in the 2012 Western Conference Finals, the Thunder have dominated the Spurs in the regular season. They’ve won 6 of their last 8 meetings, including all four this season. In the first meeting of the season, the Thunder ended an 11 game winning streak by the Spurs, upending them 94-88, behind a big third quarter (25-15). In that game, Ibaka (sad face) dominated inside with 17 points, 11 rebounds, and 5 blocks. In the second game, the Thunder used a big game from Russell Westbrook (31 points and 8 assists) and a big 2nd quarter (40-29) to defeat the Spurs 113-100. In the 3rd meeting of the season, the Thunder won 111-105 behind monster games from Kevin Durant (33 pts, 7 rebs, 5 asts) and Reggie Jackson (27 pts and 8 asts). The 4th meeting of the year, also known as the annual “if we win this game we might catch the Spurs in the standings” game, saw good performances by the Thunder’s top 4 players, leading to a 106-94 victory. 1. 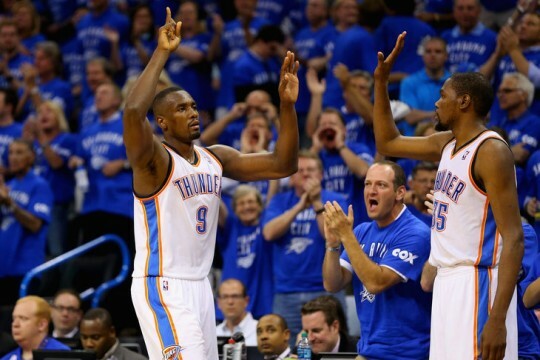 75/30 – With Ibaka out, the scoring onus continues to fall on Durant, Westbrook, and Jackson. Ibaka is probably the most consistent scorer in the leauge, always scoring between 13-17 points. To make up for that, the big 3 for the Thunder will probably have to average about 75 points per game, while the other players will have to somehow come up with 30 points. Can it be done? Of course. But the margin of error will go down with the loss of Ibaka. 2. Perimeter Defense – The Spurs have 6 players that are shooting at least 38% from 3-point land in the playoffs, with noted Thunder-killer Ginobili pitching in 31% from deep. The Thunder have had measured success in the defending the 3-point line because they have been able to keep Parker in front of them and out of the lane. Unfortunately, when Parker does get into the lane now, Ibaka will not be there to erase any of the Thunder’s perimeter mistakes. 3. Bench – If ever there was a series for Butler, Fisher, and Jackson to consistently hit shots, this would be it. The Spurs bench is leading the remaining playoff teams in scoring at 41.3 points per game. The Thunder bench averages just under 29 points per game in the playoffs. While the Thunder is top heavy, with 2 of the top 5 scorers in the playoffs, they will still need their bench to spell them during games. For the Spurs – Rebounding – With Ibaka out, the Spurs, not known for their rebounding, will have more opportunity to grab offensive rebounds and get more scoring opportunities. 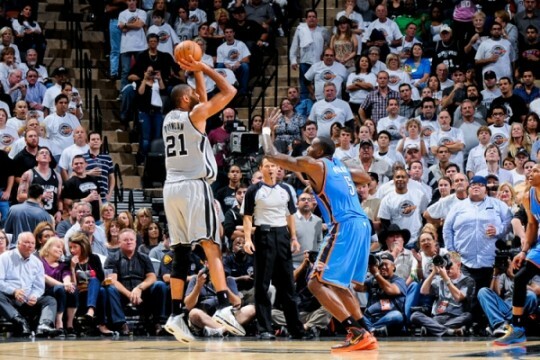 On the other end, the Spurs have the opportunity to limit the Thunder to just one shot. Another X-factor for the Spurs is the health of Parker’s hamstring. He was taken out of Game 5 of the Portland series and has not practiced with the team. Maybe something to watch as he tries to defend Westbrook throughout the series. 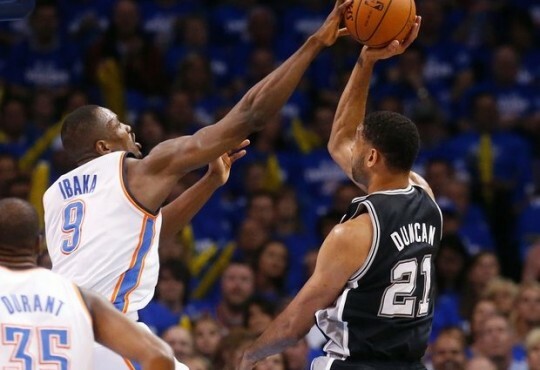 For the Thunder – Transition opportunities – The Thunder do a good job of forcing the Spurs into turnovers. That may be a bit muted now with Ibaka out in the series. Without the shot blocker in the paint, the Thunder have less leeway to gamble on steal opportunities. I love my team, but the loss of Ibaka may be too difficult to get over in this series. Ibaka puts a lot of pressure on opposing offenses that live on dribble penetration. The Spurs’ guards would have second thoughts of taking the ball inside with Ibaka patrolling the paint. Now, the defense will have to help out more and that may open up the 3-point shooting for the Spurs. 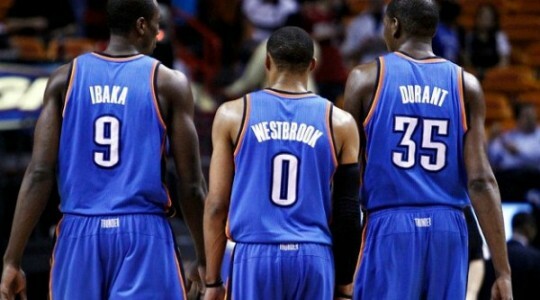 Can the Thunder win it? Of course. But they have to play close to perfect basketball on the defensive end for the full 48 minutes. Unfortunately, that has never been their greatest strength.